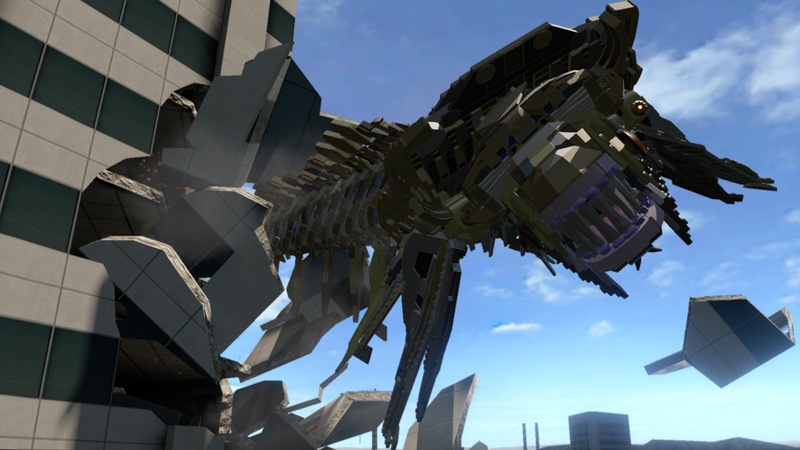 Despite the proliferation of LEGO games out there, TT Games has managed to keep the series fresh enough to keep people's interest year after year. It helps that the different inspirations they take are often wildly different from one another, from Jurassic Park to superheroes, Star Wars and more. 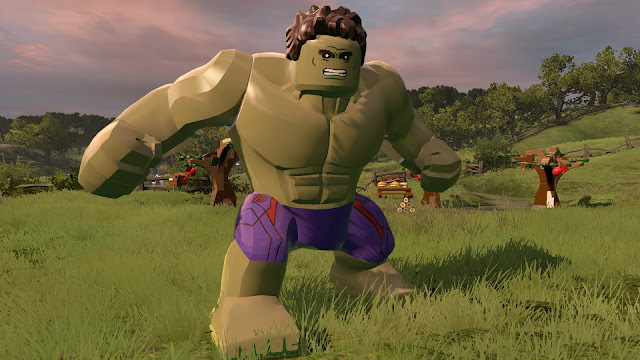 LEGO Marvel's Avengers is another example of a well-made game that is fun to play, but starting to grow a little long in the tooth at the same time. I think the Marvel games make for some of the best source material of any LEGO game. The myriad of heroes and villains, with their themes and powers, helps to create a much more diverse cast than some of the other LEGO titles out there. LEGO Marvel's Avengers continues that trend, and while there might be some similarity between characters with ranged attacks such as Iron Man and Captain America, there are enough differences in their play styles that I differentiate between them and have favourites (hint: I prefer Iron Man). Whether you have Hulk smashing or Thor bringing down the hammer, the different powers are well represented in combat and often times used well in puzzles. However some of the puzzles are more fussy than others, which I think comes with the territory when you have so many characters with different overlapping skills. Early on things are pretty well spelled out, and clearly you are meant to tackle chapters in a specific way, but man, even a few of the early puzzles were more frustrating than I was used to. The specific example that springs to my mind is one using Iron Man's laser to etch out a control panel's components. It was cumbersome and was not exactly what anyone could call inspired gameplay. Another early one helped to demonstrate the value in team attacks. These are much easier to do with a second player at the helm, and it is worth noting that LEGO Marvel's Avengers is borderline riotous fun with a friend while still giving you an actual advantage because your AI-controller partner is not always the most reliable of companions. Trying to do puzzles that mandate teamwork with that AI partner is at times a nightmare. The game starts off in high-flying fashion, with the introductory scene from the second Avengers movie. While this title was inferior to the first and several of the other Marvel movies, it actually serves as a spectacular place to springboard into the action. It plays out the action-heavy scene from the beginning of the movie, where all of the Avengers are already a team. This was a clever idea because it introduces the player to a variety of different character styles and puzzles. From there the game does a great job of tying in some of the other Avengers-related movies such as the aforementioned first Avengers and Captain America 2, as well as the less interesting Iron Man 3 and Thor 2 movies. This provides a great deal of content, from different characters (and character variants like the Hulk Buster Iron Man suit) as well as a nice variety of vehicles and locations to hoon around in. 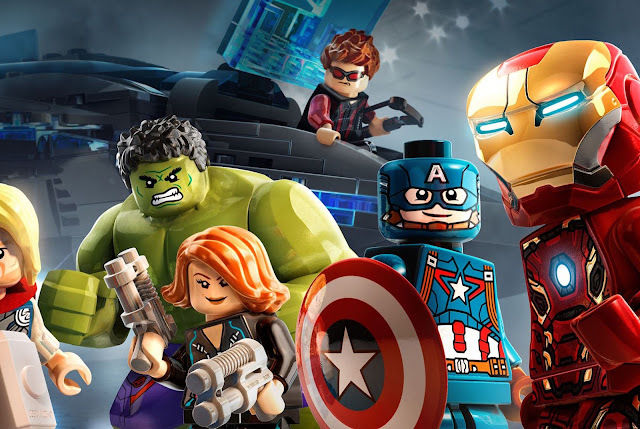 While the cast is large, it is less impressive than the LEGO Marvel Universe game that pulled in popular characters like the X-Men and Spidey. The sheer numbers may match up okay, but some of the characters are filler that lack the appeal of some of the Marvel Universe's big names. Also, because the storyline tries to follow along with the movies, there is less creativity in the narrative itself. As I touched on before, if you get close to your team mate, there is a good chance you will have a combo ability. This is illustrated in the first chapter with Thor and Captain America and a lightning bolt/shield combination. These are an absolute riot to execute and I always enjoyed seeing new combinations for the first time. In fact, this more than anything else encouraged me to try out new characters and teams. The other interesting design choice is the sound and music. The music is pulled straight from the movies, and it is obviously perfectly fitting and often quite epic in nature. Some of the actual spoken dialogue holds up better than others, with the cinematics delivering better bang for the buck than the sometimes repetitive in-game comments that a character spits out. It is also worth noting that there are some odd bugs that creep up now and again. Because you have some pretty athletic characters and flying characters who are meant to be able to move around the screen in reasonable facsimile of their movie counterparts, I found several places along the way where I got stuck by pushing the bounds of the playing field. There were even a couple of times I did not feel it was necessarily my fault, because I was knocked back/down/into some of these environmental hazards. Thankfully doing this did not cause too many issues, and the ability to switch off to another character generally remedied the situation (except one instance where both characters managed to get stuck, which was a restart to the previous checkpoint). A few new wrinkles such as the team-up attacks and the really cool audio part of the presentation are quite welcome, and I think these superhero games lend themselves to the TT Games better than most genres due to the large number of unique skills. It's reliable fun, but we keep saying this - TT Games needs to start bringing some genuinely original new ways of looking at LEGO, or the scores will start to fall as people get very tired of doing the same thing over and over again.